Two paying parking lots (P1 and P2 = 750 places) are available in front of Abidjan Airport. The price is based on the duration (1 hour = 500 FCFA). 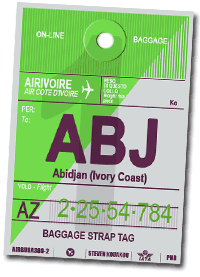 Taxis are available 24 hours a day at Abidjan International Airport. They are recognizable by their red-orange color. They have a taximeter but any ride can be negotiated with the driver before entering the vehicle. Abidjan is a very large city, and the price and the ride time (15 to 40 minutes) depend on the distance to the destination area and on congestion of the streets. The SOTRA line "MonBus 6" joins South Plateau station with the airport at the cost of 200FCFA (€ 0.30, US $ 0.35). Minibus shuttles set up by hotels run between the airport, the city center and tourist areas. Several car rental companies offer their services in Ivory Coast. Some of them have an office in Abidjan International airport where to pick-up your car 24h a day and others provide you with the car on your arrival.